A wealthy and proper fifteen year old Gallian girl who looks down on some of the less-refined habits of her peers. The emotional scars left by the Neuroi's destruction of her homeland cause her numerous problems. She often refuses to work as a team, and develops something of a dislike for the upstart newcomer Yoshika due to her attachment to Mio. When wearing her Striker Unit, she gains the dark ears and tail of a Chartreux. 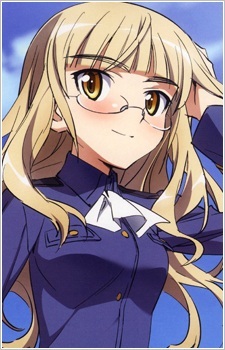 Perrine holds the rank of Flying Officer and her original unit was the Armée de l'Air 802nd Flying Corps. Carries a rapier into battle along with a Bren light machine-gun. Her Striker Unit is based on the Arsenal VG 39 and she is named after Pierre Clostermann.